After a hiatus of over a decade, the iconic jungle sensation is back as Nintendo top off their impeccable Christmas software line-up with the highly anticipated return of one of their most loved franchises, Donkey Kong Country. The original, released on the SNES way back in 1994, still remains to be one of the best-selling titles of all time achieving sales of over nine million copies worldwide. Yet can this latest revival live up to such high expectation? With original series developer Rare now under the umbrella of industry rival Microsoft, the development torch is once more passed to Retro Studios whose talents are responsible for the critically acclaimed Metroid Prime series across both Gamecube and Wii platforms. 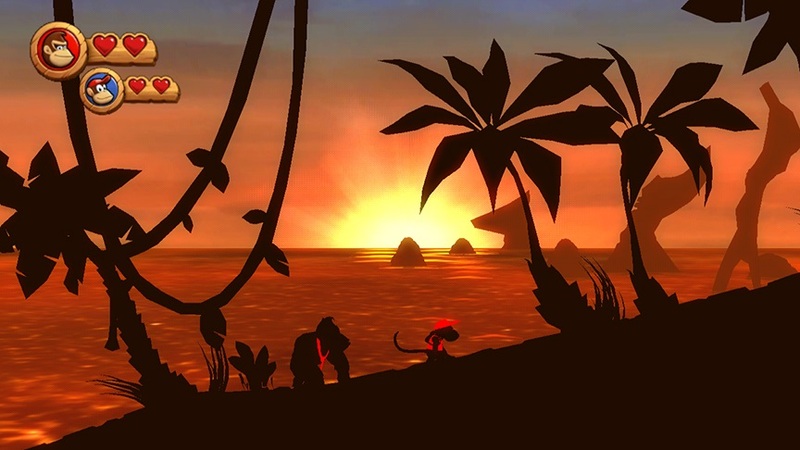 Here, the talented studio has sliced the expansive roster of the Kong family from that seen in previous entries and produced a title that focusses entirely on its namesake protagonist, alongside sidekick Diddy Kong and the elderly Cranky Kong. The product of such choice being a more centred, more modern take on the platforming classic, providing a joyously varied jungle romp across an array of different environments. In terms of its core plot, the premise is expectedly simple. DK Island has been invaded by the Tiki Tak Tribe who, through the use of their cunning, musical hypnotic powers, place the animals on the island under their spell and, in the process, use them to steal Donkey Kong’s banana hoard. Humorously not having the brain capacity to be hypnotised himself, our heroic ape, therefore, sets out with the assistance of Diddy Kong to pursue his invaders and claim back his hard earned favourite delicacy. What follows from here on out is truly a continual spectacle as you climb, roll and even rocket your way through a seemingly never-ending selection of thrilling levels, full of eye-catching visuals and set pieces that easily retain the charm and challenge of its predecessors. There are eight Worlds in total, themselves divided into an approximate eight levels, and each concludes with a boss fight in which you’re pitted against an assortment of sizeable foes under the control of the Tiki’s as they attempt to derail your progression. The titles greatest strength lies within its visual design, that, whilst remaining to be crafted within a 2D space, at times unexpectedly blasts you both to the forefront and background of levels during certain circumstances. An example of which is a level that you’ll find yourself dashing across a beach as you dodge cannon fire, before hopping in a barrel to board the ships in the background and take out the crew. Such smooth level transitions provide the majority of highlights within the game. A further situation sees waves crashing onto a rocky stretch that you are traversing, and you’ll, therefore, have to crouch and hide behind rocks to prevent yourself from being swept away by it. In a break from the standard platform fare, you’ll also find yourself progressing through exciting variations that incorporate previously seen staples of the series; both the Mine Cart and Rocket Barrel. With these, you’ll make your way through a number of nail-biting levels as you navigate your way past obstacles and, in some cases, fleeing from pursuing enemies or dangers. Further to this, Rambi the Rhino makes a welcome return providing a periodical opportunity to rampage your way through specific levels squashing all in your path. 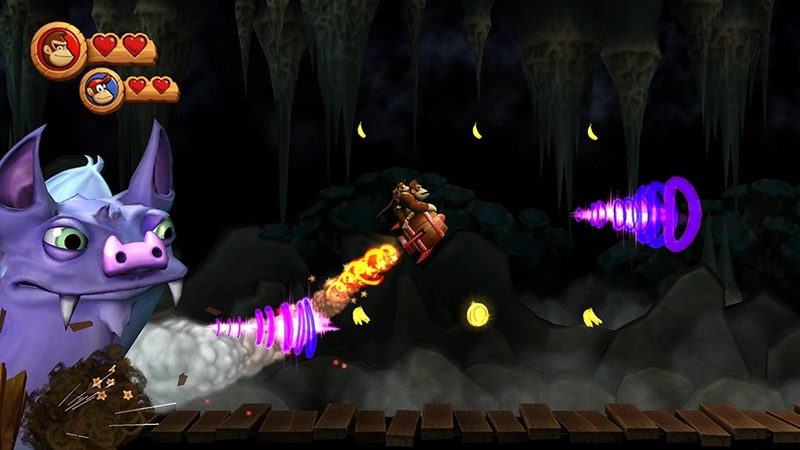 In updating the experience for the Wii, support for the motion capabilities of the Wii Remote also feature through additional moves for Donkey Kong. Whilst standing still, shaking the Wii Remote will cause Donkey Kong to pound the ground with his fists, allowing you to break through cracked rock in your hunt for collectables or even flipping enemies to make them vulnerable. Doing the same whilst moving causes you to roll, temporarily speeding you up in the process, yet performing the same gesture whilst crouching grants you the ability to blow air in whichever direction you are facing. Such a questionable addition performs a range of tasks; causing flowers to spin to reveal hidden collectables or blowing out the flames that engulf and protect certain enemies to allow you to neutralise them, for example. Although the concept behind such motion-orientated implementation is valid, their execution can at times, unfortunately, add to the overall frustration levels. Whilst not necessarily overly sensitive, at times you may find yourself accidentally rolling off a platform, whereas some of the more awkward jumps require you to roll and then jump to gather a boost in momentum – something that is never explained to the player. The assistance of Diddy Kong in single-player is a huge help, granting you with an extra two heart containers and the ability to utilise his Barrel Jet to allow you to hover briefly. It’s an enormous help within some of the increasingly hectic platforming, yet unfortunately the same can’t be said when introducing a second player for a round of multiplayer. Under the control of a second player, Diddy Kong gains the ability to fire off rounds from his Peanut Popgun to stun enemies, yet such an addition never really feels as if it’s a necessary one. Whilst you are still able to utilise the Barrel Jet by climbing onto Donkey Kong’s the whole experience begins to feel a little too complicated for its own good by both players at times becoming overly dependent on each other. With one player controlling the standard platforming, and the other using the hover capabilities where necessary it is quite easy for one player to have a lapse in concentration that will lead to your lives dwindling far faster than normal. It’s a great challenge for a duo of advanced players, but it never reaches the level of irrepressible fun that was achieved within last year’s New Super Mario Bros. Wii. It’s a slight disappointment, and younger players may also find the more co-operative orientated play style a little too taxing. Scattered throughout each level are a number of collectables, including the familiar Bananas, Banana Coins, Balloons and K-O-N-G letters alongside a variable quantity of Jigsaw Pieces – the latter of which must be gathered to unlock content across Image, Music and Diorama Gallery’s available to view through the Extras menu. For those looking for a little assistance on their ventures, Cranky Kong returns to offer a selection of wares through his trusty shop where you may spend any Banana Coins you collect. Whilst bundles of extra life balloons are the necessities, you’re also able to purchase various one-time use upgrades that may be equipped and utilised within any level. These include Squawk the Parrot, who assists you in locating puzzle pieces by making as much noise as he possibly can when you stumble near them, extra health or a potion that grants temporary invincibility which you’ll more often than not save for the game’s plentiful difficulty hot spots. More importantly, however, across each world that you visit good ol’ Cranky provides the opportunity to purchase a gold Map Key for a measly twenty banana coins, allowing you to unlock a series of levels that lead you along an alternate route towards the eventual boss fight. 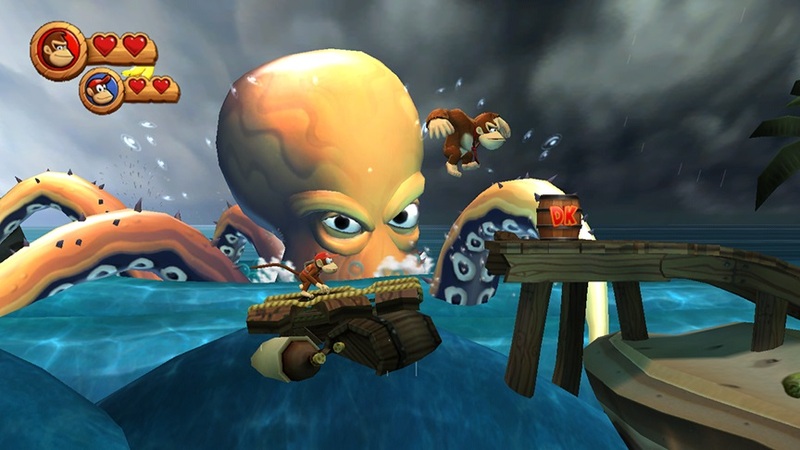 More often than not, such paths also hold some of the game’s more unique and stylised levels – the ‘Sunset Shore’ level within World 1 being just an early example of Retro Studios making slight tweaks to the art direction that allows you to stare in disbelief at the simplistic beauty of some truly astounding visuals. Whether or not you invest in the Keys, upon the game’s completion you’ll still have a number of levels that you more than likely won’t have even played through yet. On top of this, you’re also offered the chance to challenge yourself by speeding your way through each level as you progress through Time Attack mode, whilst the array of collectables that have been missed also remain hidden within every nook and cranny waiting to be discovered. However, make no mistake. In terms of difficulty, Donkey Kong Country Returns will at times have you tearing your hair out in places, cursing the screen as if such errors weren’t your fault, and even thumping anything nearby in anger in ways that even the game’s central ape-tagonist would be proud. There are places in which you’ll encounter plenty of cheap deaths, yet such an aspect lends itself well to ensure that although you’ll become annoyed in places, on the whole the entire experience is so varied that you’ll never stop enjoying yourself. 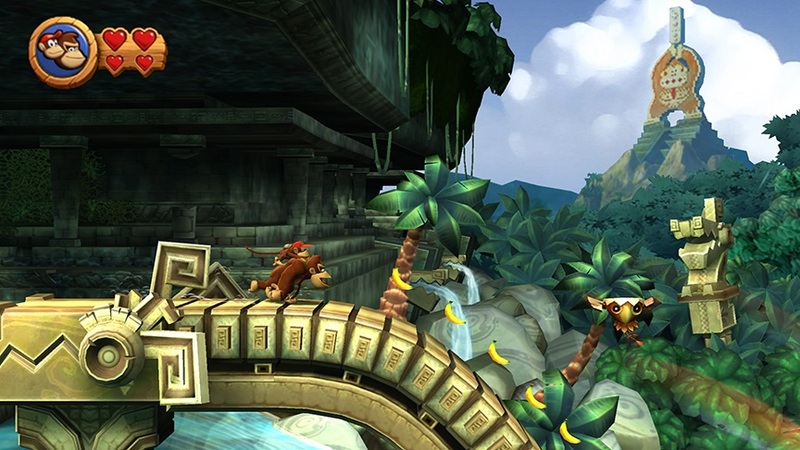 Luckily, even with the difficulty progressively ascending throughout the game, Retro Studios have catered for this by providing a slew of Bananas, Banana Coins and Bonus Lives ahead of particularly difficult sections, not only as a pre-warning but to also ensure that even if you do die there’s the likelihood that you’ll be able to gradually claw any lost lives back. Further to this, for those that are finding certain sections overtly rage-inducing, the ‘Super Guide’ facility, seen within New Super Mario Bros. Wii, has also been implemented. Rake in an essential ‘death streak’ whilst traversing the game and you’ll be offered the chance to activate the guide, transforming Donkey Kong into a white-haired super version of himself which will then, controlled by AI, play through the entire level. Unfortunately, doing so will sacrifice any K-O-N-G letters or jigsaw pieces that you gather, and any that the AI incidentally picks up themselves will be discarded. Still, it’ll save you the hassle of getting stuck within certain portions of the game. Without a doubt, Donkey Kong Country Returns becomes the latest in a long line of must-have Wii titles released this year. So, whether you hastily scribble it onto your Christmas list or place your pre-order, ensure that you don’t miss out – Donkey Kong is, without a doubt, back in style.